Anglo-Gallic. Richard the Lion Heart. Duke of Aquitaine. AD 1172 to 1189. Silver Denier. Denomination : Silver denier. Mint : Poitou (Melle). Date : Richard I as duke of Aquitaine from AD 1172 to 1189, but this issue was probably between AD 1172 and 1174. Size : 19.2 x 19.7 mm. Weight : 0.87 grams. Grade : aVF with a slight wave in the flan. Obverse : Short cross with RICARDVS REX around (the X is a very strange form). Reverse : PICTAVIENSIS in three lines. 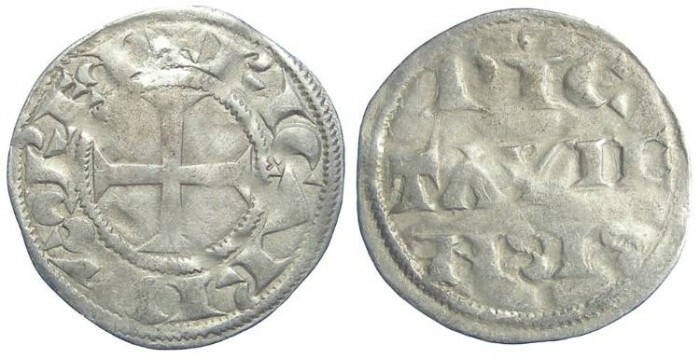 These coins of Aquitaine are the only coins of Richard the Lion Heart which have his name on them, but unfortunatly they do not have his portrait. The English issues have a stylized portrait but are struck in the name of Henry.